I am back again with another tassle filled post! This piece is also from Moon and Lola's recent collection for this Spring/Summer 2017 season! The Patong necklace comes in two lengths (short or long) and a slew of colors which means you guys have plenty of gorgeous options to choose from. I wanted to go for a layered look so I chose to style two long necklaces with one short necklace to add a little dimension. 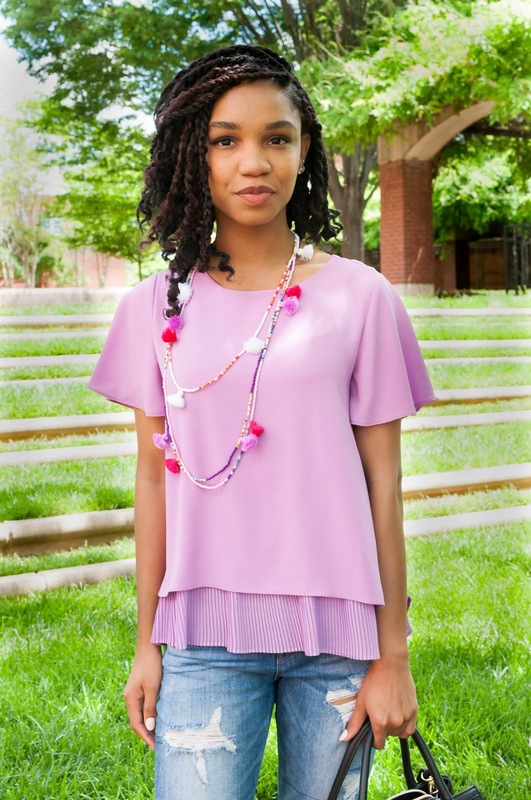 These pieces went perfectly with my lavender shirt I bought from The Limited--before their business hiatus--and I never truly styled it until now. It is such a cute top that can be worn casually or in the office and I love how the second layer of accordion pleats adds a bit of flair! I am not sure if you guys remember me talking about my beloved boyfriend jeans I won at an Express Campus Event, but here they are! 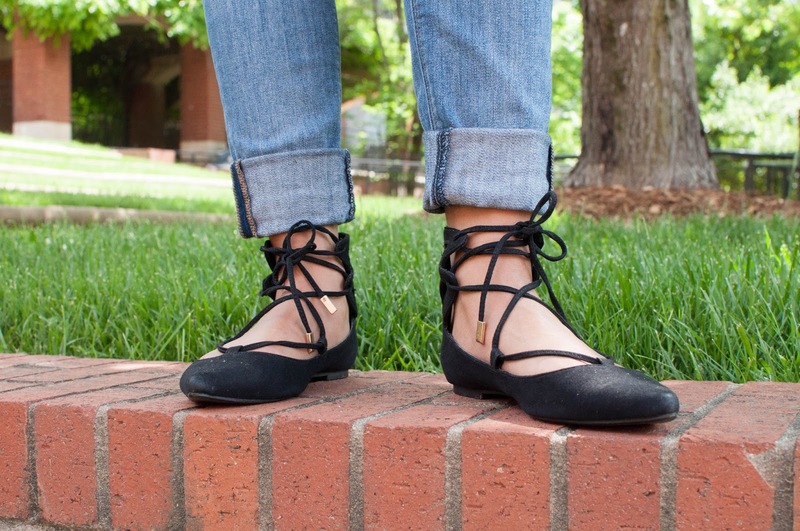 These are my go-to for everything from running errands to cute everyday outfits where I really want to be comfortable. They are actually made in the legging style, but since there was only a size four left--and I could not let $80 jeans go to waste--I wear them a little bigger than normal and style them as boyfriend jeans. If I have to wear jeans then these will always and forever be my first option. This Spring/Summer season I am challenging myself to open up to more color. If you have read my blog or followed me for sometime, then you know that I love black. It may not always seem that way from the outfits I post but I make a conscious effort to implement color into my wardrobe. Otherwise, each post would look like it came from Wednesday Adams' closet. I know I am not the only noir lover out there and I want to be a help to all of us so I have 3 tips on how you can keep a nice cycle of color in your wardrobe. Now I know in my last post I said I was going to try out more patterns this season (and I am) but when I first started this color adventure I avoided patterns like the plague. Only because I wanted to get comfortable with my taste in color and finding out which color combinations worked the best. Taking small steps into trying out color will help prevent you from choosing a patterned garment that makes you cringe after two weeks. 2. Utilize Your Fashion Neutral Colors. These colors are your best friends: white, black, navy, khaki, and when it comes to fabric, denim. They will help keep the balance in all of your looks so you don't end up looking like a color wheel gone wrong. 3. Dress Up With Accessories. You guys know I am an accessories fiend. I lost all of my jewelry when I moved out of my apartment last summer, but I have completely replaced that collection with a whole new one and then some! 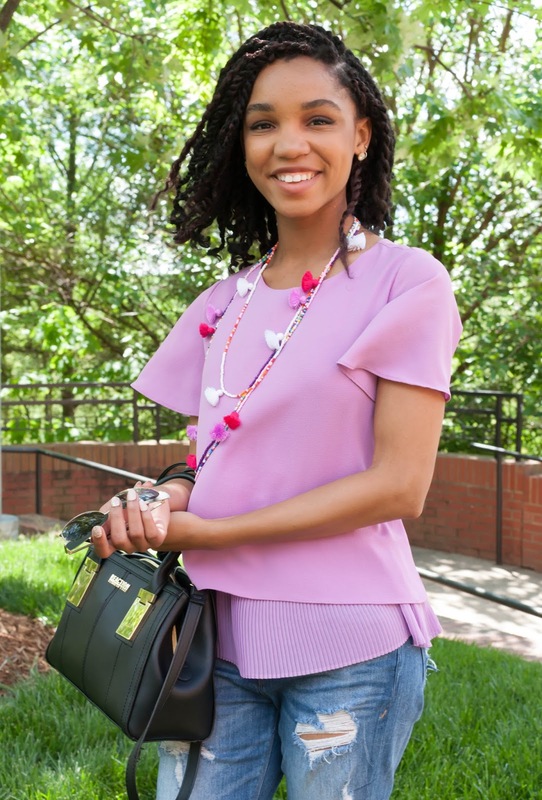 Accessories are your best tools when trying to dress up any colorful top or bottom; similar to what I I did here with my Moon and Lola necklaces. I utilized all of those steps in this look. First by choosing to avoid patterns and go with a simple lavender top (or a color of your choice). 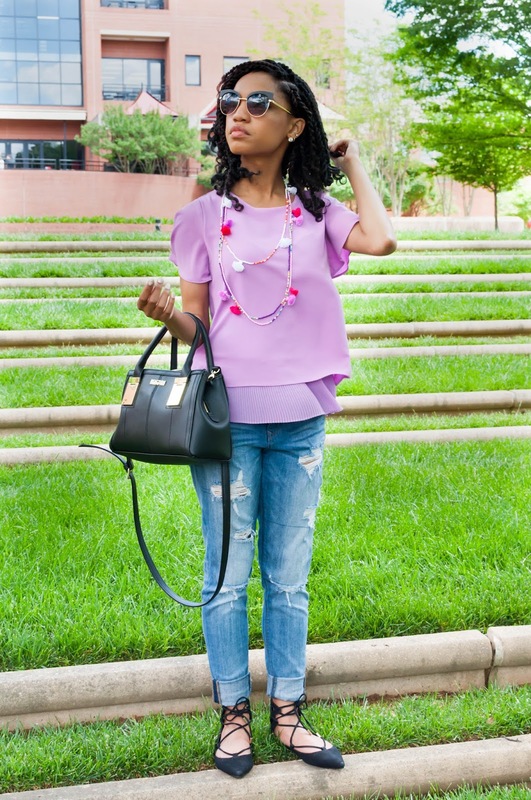 Then, I made sure to partner my colored piece with a fashion neutrals, which is where my boyfriend jeans, purse, and lace-up flats come into play. Finally, I chose to explore color even more through my choice of accessories. The Patong necklaces added interest to my look with the different accents of color and texture, ultimately drawing everything together. I love my Patong necklaces and if you do to you can purchase them on Moon and Lola's website. Make sure you use my discount code AALSTON10 for a 10% discount on your purchase! There are more accessory and outfits posts to come. Until next time!